Myanmar's importance on the "geopolitical chessboard" of US strategy in Asia allows its leadership to remain unscathed despite the outbreak of violence which has forced the Rohingya minority to flee their homes, international lawyer Barry Grossman told Iran's Press TV. The actions of the Myanmar security services against the Rohingya minority in the northern state of Rakhine is "state-sanctioned terror," which is being carried out by the government of Aung San Suu Kyi with the backing of the US, international lawyer Barry Grossman told Iran's Press TV. He said that Muslims in Myanmar are being forced to leave their homes in a mass expulsion which is similar to that faced by Palestinians in 1948. "The cult of Aung San Suu Kyi was fabricated by elements in the Atlantic World establishment committed to imposing a US-led, New World Order which, of course, is only a slightly more neutral term for the neo-conservative plan to impose what they inaptly refer to as Pax Americana," Grossman said. "Her position seems to be that if she denounces the state-sanctioned terror against the Rohingya, she will forfeit no small part of her grass roots support in Myanmar, so she seems relatively unconcerned that by saying nothing, she will be judged by millions of people around the world as being responsible for those very same atrocities,'" he asserted. Myanmar's de facto leader Aung San Suu Kyi was awarded a Nobel Peace Prize in 1991 in recognition of her campaign for democracy, but the Norwegian Nobel Committee has faced calls to revoke the prize in protest at her handling of the Rohingya crisis, a long-running conflict which flared up last month. Grossman said that Myanmar's proximity to China gives it geopolitical importance which makes the US reluctant to criticize the security services' actions. He likened the country to a "knight" on a geopolitical chessboard. "Why is the Atlantic World political establishment not acting? Well, it certainly isn't due to doubts about the atrocities being perpetrated against the Rohingya. The conventional thinking is that, with Myanmar's proximity to China, in chess terms, Myanmar has the status of a knight or perhaps even a rook in the old geopolitical game Zbigniew Brzezinski once infamously characterized as 'the Grand Chessboard.'" In this Friday, July 14, 2017 photo, Myanmar Border Guard Police (BGP) officers walk along a path ahead of journalists in Tin May village, in which Myanmar government and military claim the existence of Muslim terrorists in Buthidaung, Rakhine State, Myanmar. Under former President Barack Obama, the US tried to carry out a "Pivot to Asia" and strengthen ties with Asian countries such as Laos, Myanmar and Vietnam. Despite those efforts, China's Belt and Road project appears more attractive to Naypyidaw, which is in talks to buy electricity from China, Reuters reported last month. "The corporate and special interests who championed Hilary Clinton in the last US election spent years working with think tanks, neoconservatives, and hawkish elements in the Atlantic World security apparatus in order to engineer a strategy for containing China while at once promoting Atlantic World corporate and military interests, all of which was packaged using the 'Pivot to Asia' paradigm sold by Hilary Clinton as Obama's secretary of state. That agenda staked no small part of the accompanying tactical plan on a policy of not-so-cautious engagement with Myanmar," Grossman explained. On August 25, Muslim insurgents used sticks knives and crudely made explosives to attack 30 police posts and an army base in Rakhine state. The military response of the country's authorities triggered violent clashes, which claimed the lives of at least 402 people, including 370 militants, 15 policemen and 17 peaceful civilians. On Friday, the UN said that approximately 270,000 Rohingya Muslims have sought shelter in neighboring Bangladesh since the violence erupted two weeks ago. The Rohingya people are a stateless minority in Myanmar, where the majority of citizens are Buddhist. Most Rohingya have never been granted citizenship of Myanmar because the government considers that migration to the country which took place during British colonial rule was illegal, and requires that applicants prove their roots go back further than the beginning of British occupation in 1823. The tensions between Muslims and Buddhists in Rakhine State began more than a century ago during British rule and have escalated in recent years. 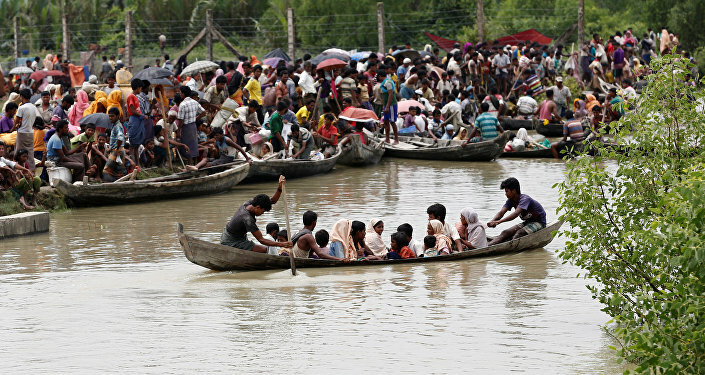 Violent clashes also occurred in 2012, when over 100,000 Muslims fled their homes for refugee camps in Bangladesh.